Some of the most interesting things that you see online can really puzzle you and even make you question if they are real or not. There is nothing better than trying to figure out something you failed to understand initially and eventually finding the story or the reason behind it. 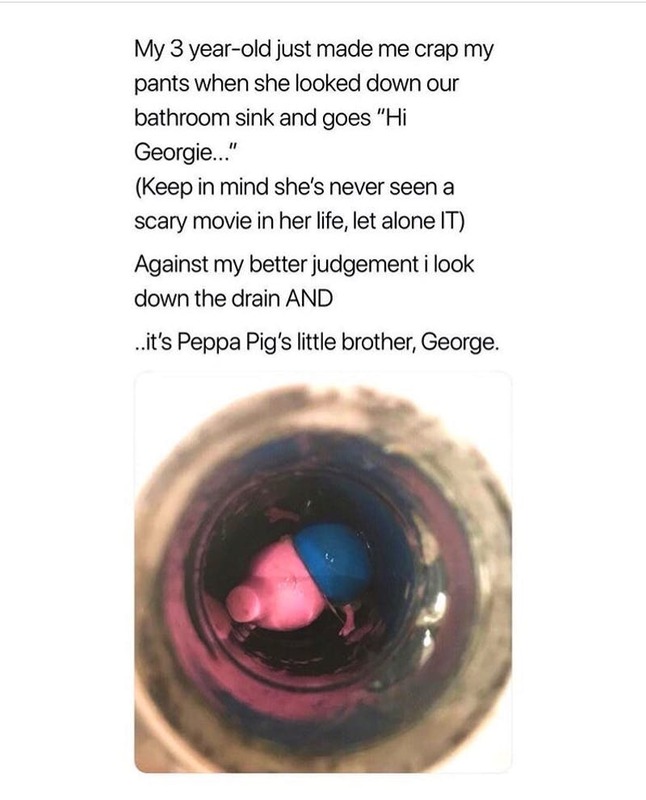 In some cases there is a simple explanation to be found, but there is also the possibility that someone simply took a weird decision or made a wrong choice. The compilation of images shown below features situations which are more than curious and we believe that most of them can spark anyone’s curiosity in an instant. People are not so gullible as they might appear to be and sometimes others try to fool them in the most ridiculous ways! This is especially true when someone is unfaithful and tries to cover things up so their partner would never understand. This includes a variety of different excuses, some of which might actually sound innocent, but in certain cases the excuses people come up with are absurd. 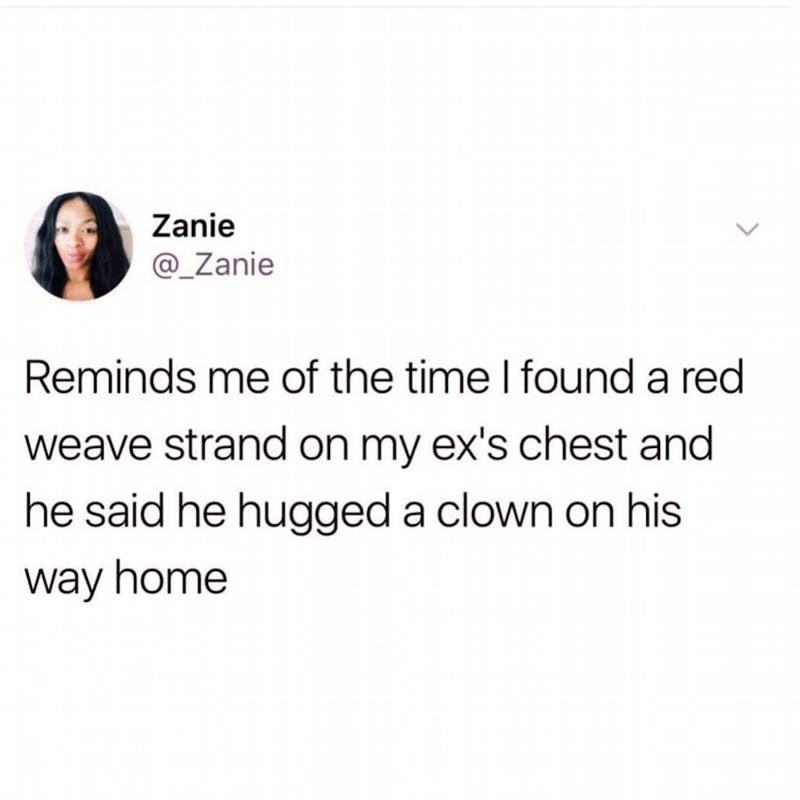 The story this man thought of as a way to explain the red weave strand was definitely not the best idea. Nobody would believe it! 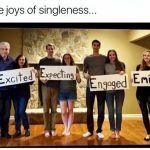 We actually laughed out loud when we saw this ridiculously funny story! We have heard about similar ones before, but this has got to be the best one yet. 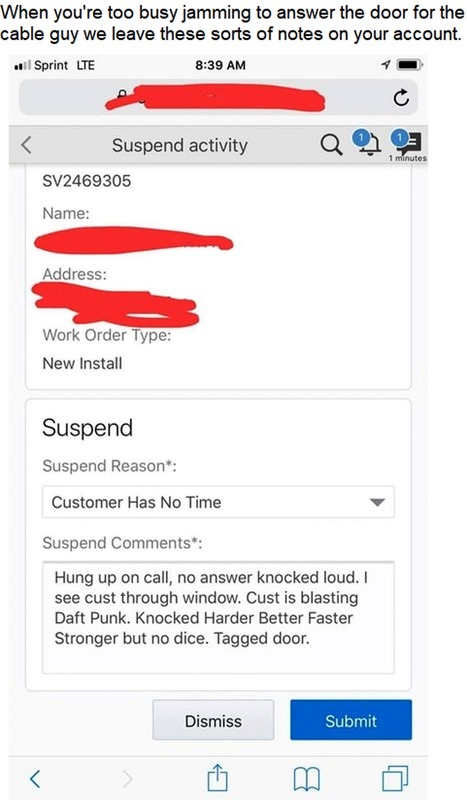 The person who called the cable company and requested some kind of assistance probably forgot about and decided to have some fun instead, so they blasted Daft Punk tunes and partied alone at home. Unfortunately, the cable guy failed at every attempt to draw the client’s attention and later filled in the funniest possible report! It is one thing for a person or a team to do their job properly, but it is a completely different story when they do something extra just because they love their job and they are willing to provide the best customer support possible. This is what the staff at this hotel did. 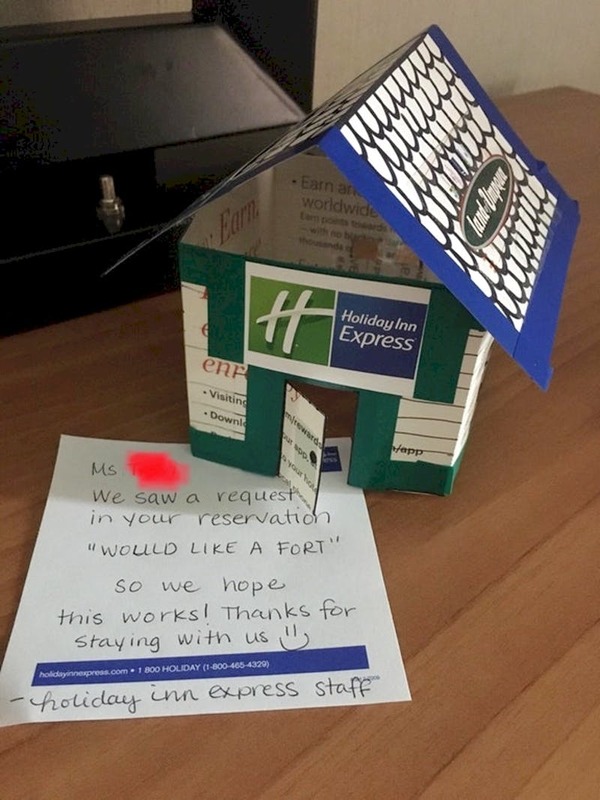 They decided to deliver to the request this client made when they submitted their reservation and they actually built a fort! It looks awesome and the time and effort they invested in making it is admirable! Fans all around the world are devoted to their favorite things. Some worship a certain performer or an actor while others love some random automobile brand, for example. Then there are the people obsessed with a certain TV show or a movie. We know such people and their lives are often guided by something that the movie features or they make a certain kind of tribute to it. 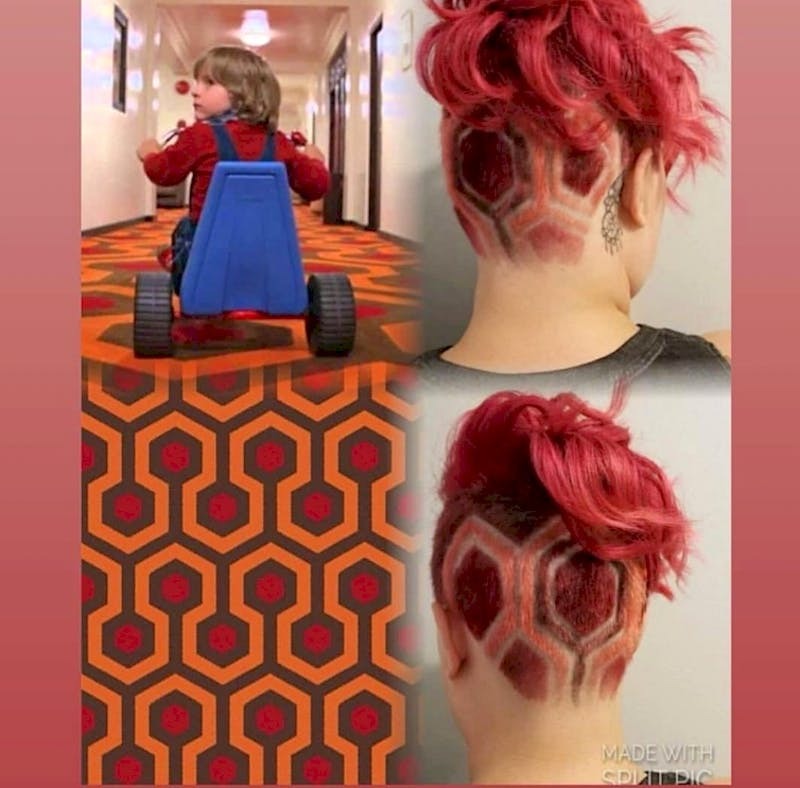 As you can see, this person definitely loves The Shining and she decided to show it in a way we have never seen before! This is something we have never seen before but we definitely approve it! 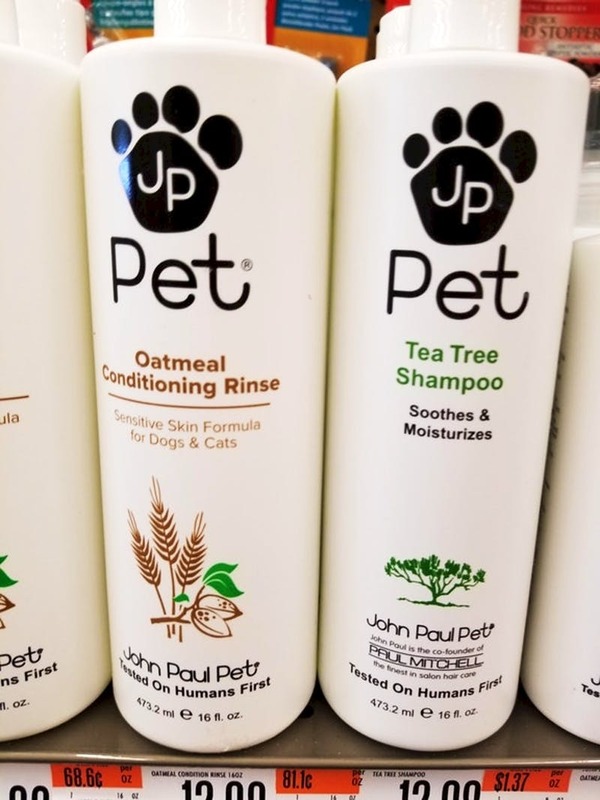 As you can see, this is a fancy line of pet shampoos and they look awesome, but apart from the ingredients and the application they have, there is one curious detail about them. The bottom part of the bottles features a statement that we really liked. It appears that the manufacturer either has a good sense of humor or they actually gave the concoctions to people for testing before putting the final product for production. No matter where you live, you have probably heard that there are places on Earth that are exposed to scorching temperatures during the summer, but it is one thing to know it and a completely different one to experience it! We guess that some places are so hot that it is unbearable and this image proves it! 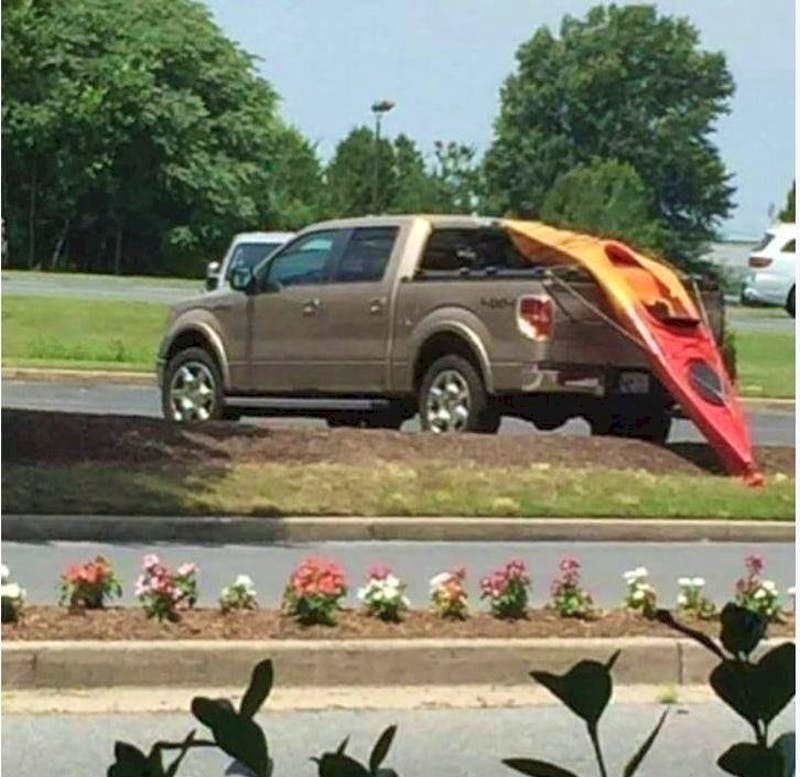 The kayak literally melted while sitting in the back of this pickup truck and we cannot believe it! We cannot image just how high the temperature was, but we are sure that it was probably hard to breathe outside! When it comes to business and the food industry in particular, we are more than sensitive about it and we believe that most foodies are like that, too. This is why we are left frustrated or annoyed on many occasions and the image shown here features an example why this happens. Someone decided to sell a product that is actually a lot smaller than the package suggests. 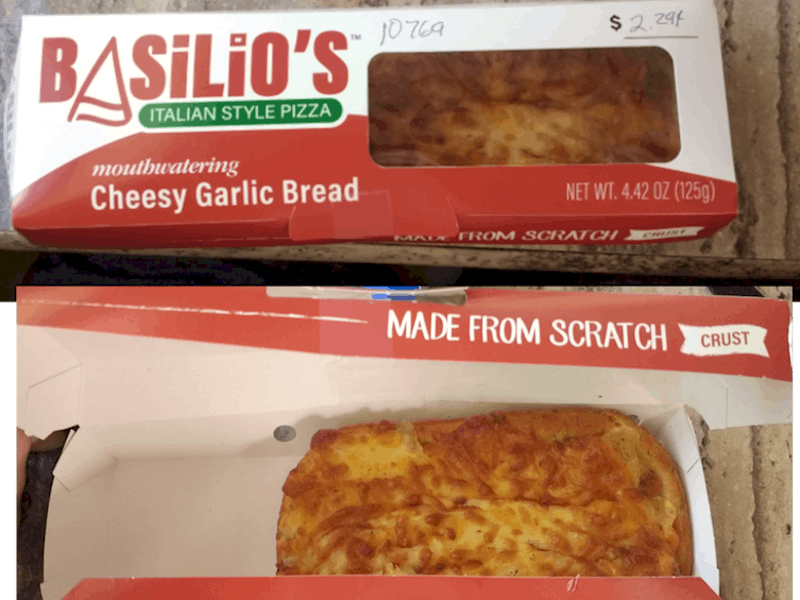 When it comes to pizza, things become even worse because we cannot tolerate an attempt of deceit related to pizza! The marketing specialists at this company need to rethink their strategy. This image might not look like much, but it features an effect we have never seen before. 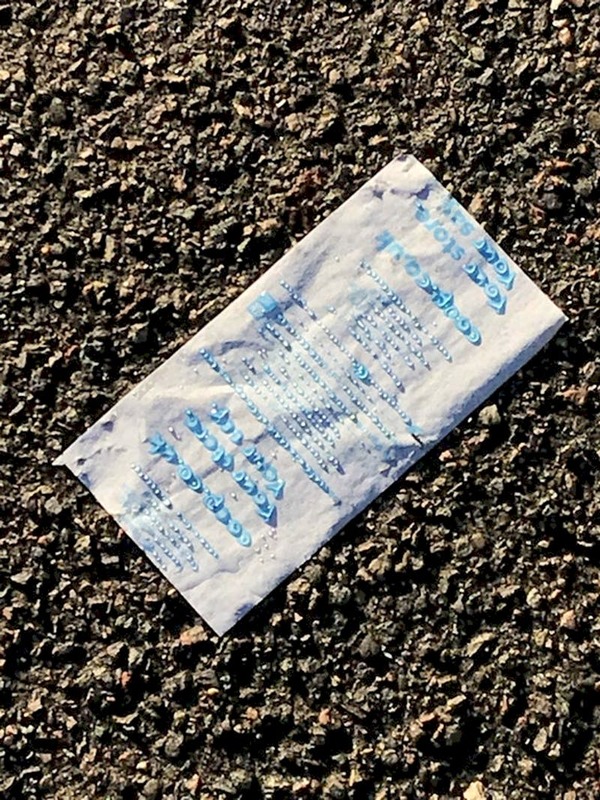 It is just an old receipt someone threw away, and it got stuck on a parking lot. The interesting part about it is that it is covered in drops of morning dew, and someone noticed a curious pattern. It appears that the dew drops are only covering the parts of the receipt where there is ink. We have no explanation about this and it is the first time we see this happening. You have heard the saying ‘they grow up so fast’, right? Well, it seems that newer generations grow up before they actually become adults! 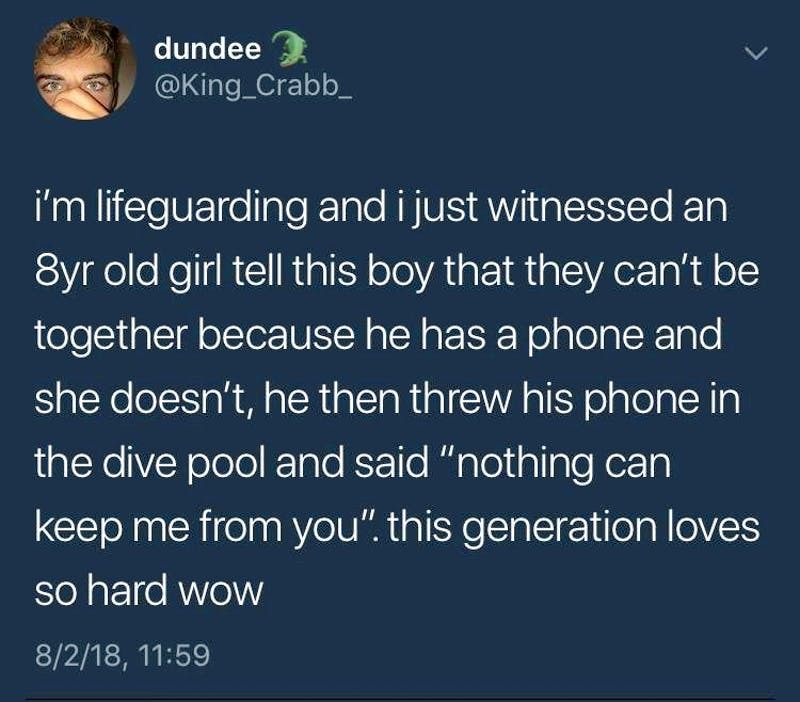 The story this lifeguard shared on social media is both funny and unbelievable, but it also made us wonder about some things. 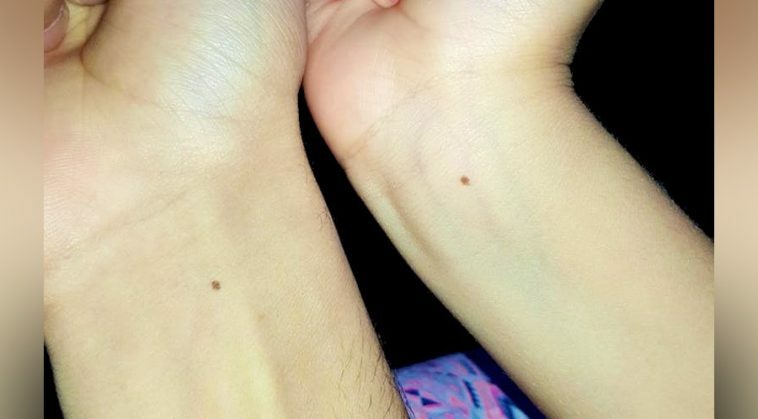 Kids nowadays have access to everything and they learn some things that are typical for grown-ups, meaning that childhood as we used to know it is no more. Many people underestimate experience and having the right skillset. As you can see, someone obviously learned a lesson the hard way! 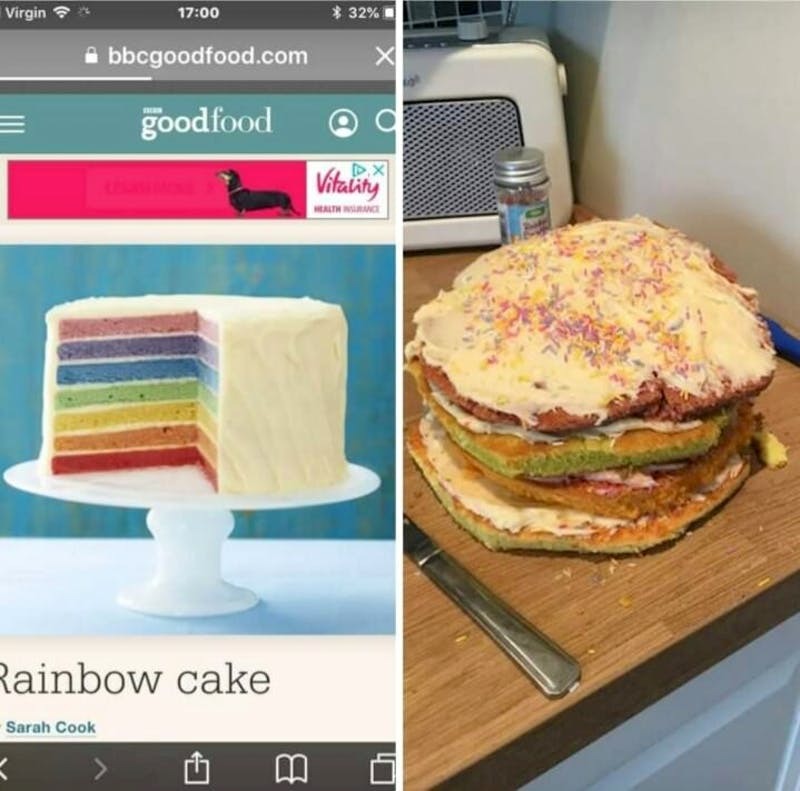 This person decided to make a rainbow cake and they probably thought that it would be easy, because they had the exact recipe and all the ingredients. However, not everything is as easy as it looks. The end result of this effort proves that! It looks like a completely different thing and it doesn’t even look like a cake! Many people claim that toddlers can see things that adults can. There are many stories about kids who are able to see ghosts and they accept them as imaginary friends, but we still refuse to believe such stories. In this case, one toddler’s mom was involved in a simple but interesting situation, and she was glad to see that it was a false alarm. We would react in a similar way under such circumstances for sure! We believe that one of the most important ways technology changed our lives is the way we date new people. The old-fashioned blind dates and meetings at the bar are pretty much obsolete and most people get together through social media. It actually allows numerous ways to hook up with someone but it can also be an obstacle. 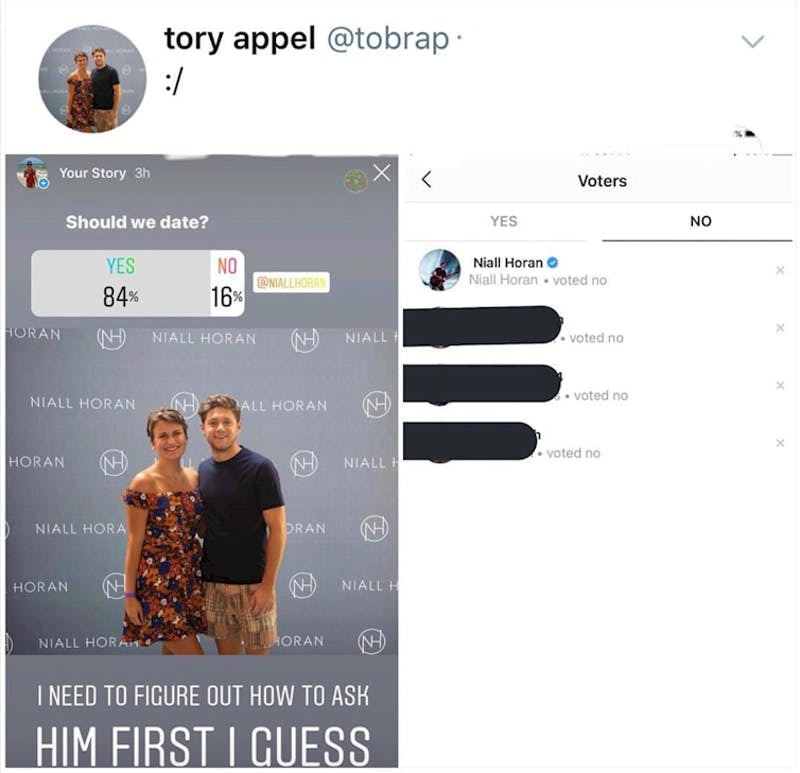 This person tried to be original, but their object of interest either had a brilliant sense of humor or he had no intention of dating the person who posted the poll. 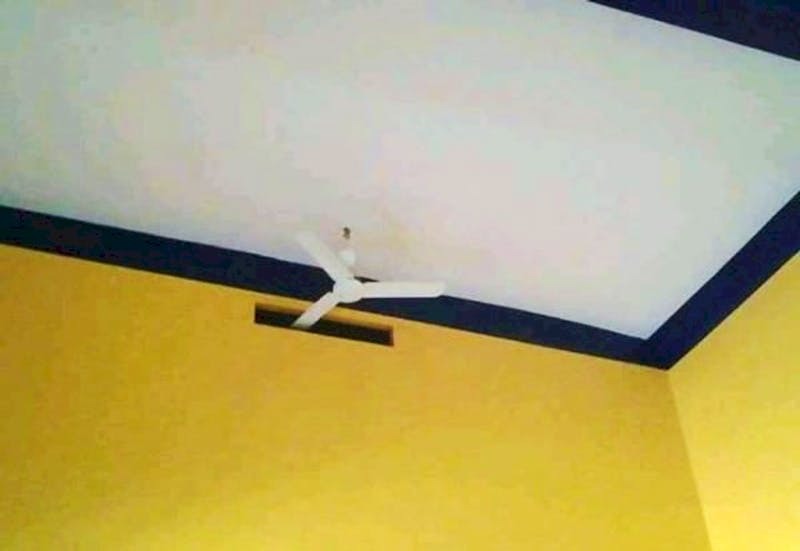 We have seen all kinds of construction and design fails but this here definitely tops both of those lists! We spend a long time looking at this image in disbelief and we just had to accept that it actually exists! How could someone allow for this to happen in the first place? 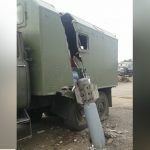 Sure enough, they made it work in the end, but it looks like it was not the best way of handling this situation, not to mention it looks like the fan would not be as effective as it was supposed to be. 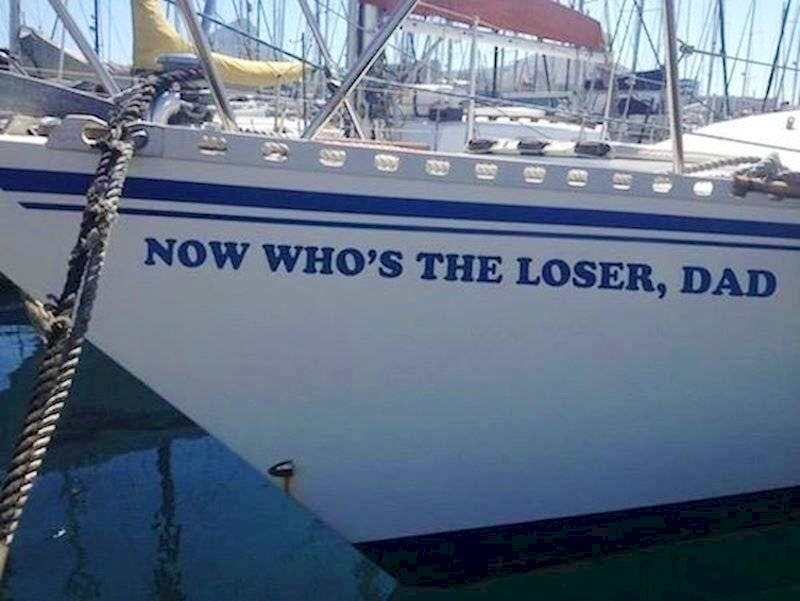 There is no better way to make a statement than showing someone they were wrong by naming your boat in a specific way. We guess that this person waited for years until this moment came, and we are certain what the reason for this to happen was. The father probably had doubts about is son succeeding, so the son showed him what he was made of! We have been to a carwash many times in our lives, but this here is something different! It seems that technology enhanced even the process of washing a vehicle! 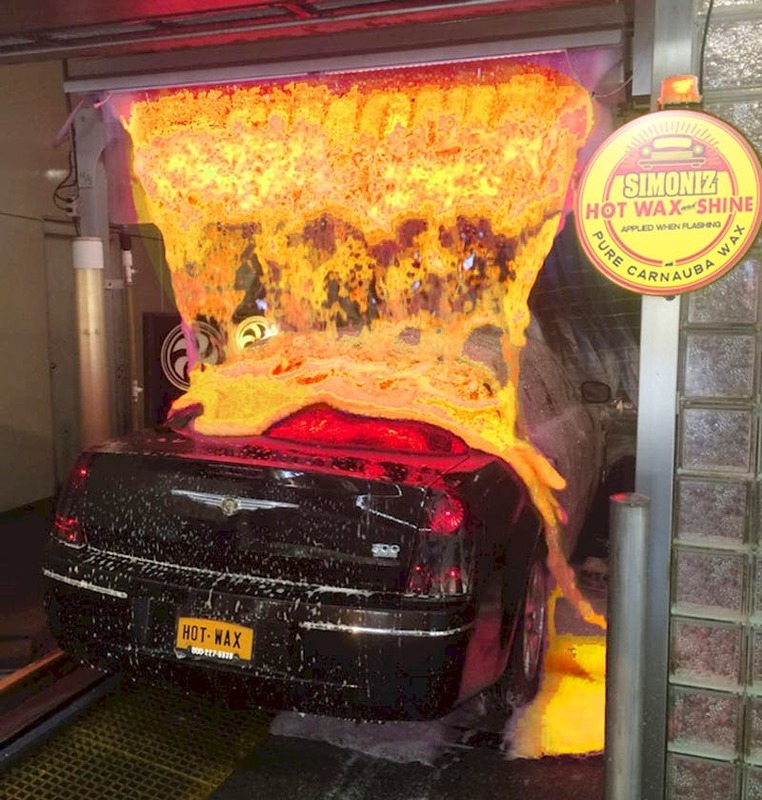 This machine looks like it is pouring melting lava on that vehicle, but it is actually how wax! It looks really scary and the feeling you get while seeing your car treated must be gut-wrenching!